Could summer finally be here? The first day of summer (marked by the Fête de la Musique) may have already passed, but with people still bundling into jackets and sweaters, you would never think that July is just around the corner – and in fact, a few hours away! Today for the first time there seemed to be something authentically summer-y in the air – a little bit humid – despite being grey – and definitely pleasant enough to enjoy a seat at your local café (though of course I can’t wait until it’s so warm that one just wants to lounge in the Champs de Mars all day). Paris is one of the best cities in which to enjoy being outside during the summer; and the very recent White Dinner, this year held at L’Etoile, was a wonderful example of how Parisians do love to take advantage of the best the city has to offer. 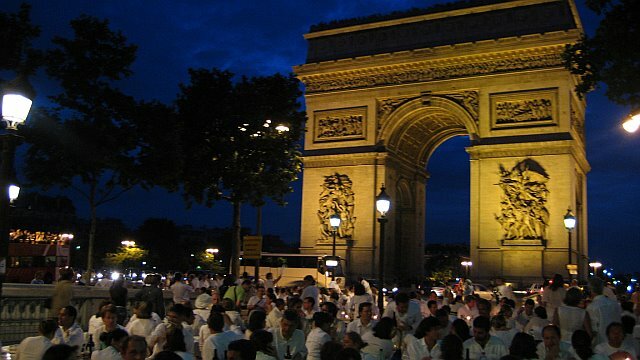 The White Dinner is a wonderful little invention, by a group of people who are seriously in love with Paris, and happy to organise this secret dinner tout en blanc for 4-5,000 of their closest friends-in-the-know. 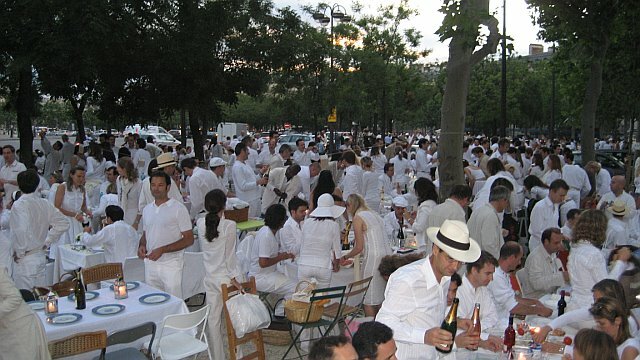 With different rally points around the city, the location is identified at the very last minute; when everyone, dressed head-to-toe in white, must scramble with tables, chairs, champagne, wine, food, candles, etc. to install at the marked points of their assigned location. The end result is the most achingly sophisticated and refined al fresco dining experience; and definitely an event not to be missed! Oh I love your blog! I am an American who used to live in Paris and I will continue to live there vicariously through you…..can’t wait to see what you write about next! Hey, i waas surfing the web and i saw your blohg, pretty cool. May i link u from mysite?